DVD Lens cleaner with interactive on screen instructions in eight different languages is simple to use and has thunder on brush system. DVD Lens cleaner having equipment set up and enhancement features is ideal for use with home theater. Cleaner designed to have thunder on brush system and interactive on screen instructions can be used with game players. After even 20 hours of playing time, dust and contaminants can get into your DVD system, impairing performance. The DVD Lens Cleaner automatically cleans off the lens, optimizing your lens' ability to read discs. Removes dirt and other small particles. 3 super-fine microfiber brushes. For use with DVD players, Blu-Ray players, laptops, and DVD/Blu-Ray gaming systems. 5.1 channel system check. Keep your movies and videos clear with this specially designed lens cleaner that works with DVD Players. Multilingual cleaning instructions. Includes system audio check and home theater setup. Each package comes with 1 unit DVD Lens Cleaner for DVD Players. Pictures may be magnified to show detail. For further information on size, color, conditions please refer to the item description or please ask a question before buying. Each Package Comes with 1 Unit DVD Lens Cleaner for DVD Players. For Use with DVD Players Blu-Ray Players Laptops and DVD/Blu-Ray Gaming Systems. Removes Dirt and Other Small Particles. 3 Super-Fine Microfiber Brushes. 5.1 Channel System Check. Multilingual Cleaning Instructions. Includes System Audio Check and Home Theater Setup. 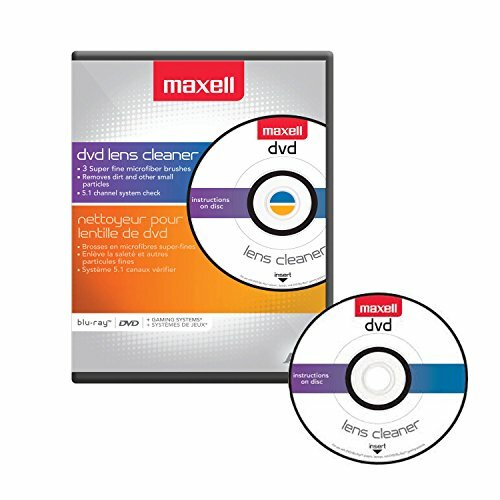 If you have any questions about this product by Maxell DVD Lens Cleaner, contact us by completing and submitting the form below. If you are looking for a specif part number, please include it with your message.